Click on this link if you need more information about a Data Logger. The portable data logger for temperature and humiodity of the OM-EL-GFX Series measure and store up to 252,928 readings. Using the included Windows® control software users can quickly set up the data logger and view downloaded data by connecting the device to the computer’s USB port. 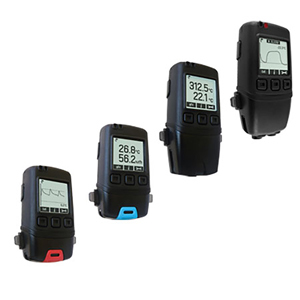 The data logger features a high contrast graphic LCD display and three input buttons. This allows users to start, stop and restart the data logger using on-screen menus. The menu also provides real-time analysis of data either as a data summary (showing highest and lowest readings and alarm conditions) or as a graph that updates as new data is added. The maximum and minimum readings and also the time and date these are valid from can be displayed on the LCD display by using the info button. If desired, the user can then reset the maximum/minimum readings shown. Each time the maximum/minimum readings are reset while logging, an “event marker” is created in the data. When the data has been downloaded to the computer these events can be viewed on the graph (event markers), and they also appear in the data file associated with the corresponding log when the reset took place. This can be useful as an audit/validation tool for certain applications where procedures mandate that a regular physical check of the logger/statistics have taken place. Multiple data logging sessions can be stored on the device ready for upload to the computer at a later time. The data logger’s robust design provides IP67 waterproof protection (OM-EL-GFX-1 and OM-EL-GFX-2 only), and the two replaceable ½ AA batteries typically allow logging for up to one year. Nota: Comes complete with Windows software and operator’s manual on CD-ROM, 2½ AA 3.6V lithium batteries, USB cover, mounting clip and 1 m (3.2') USB cable. OM-EL-GFX-DTC also includes 2 Type K insulated beaded wire thermocouples.